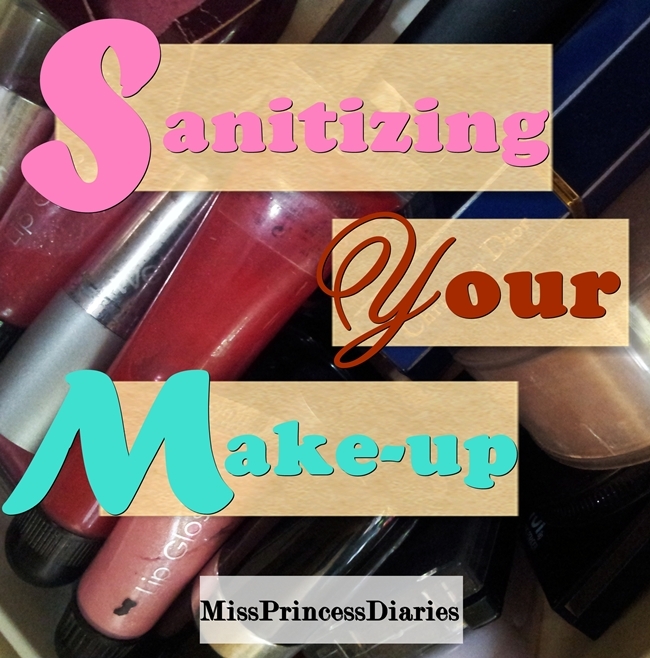 You might be so meticulous with specific beauty products you put into your face but, are you aware of the bacteria your make-up products harbor when you don't even clean or sanitize them? Oh, gross! or even worse if you share your make-up products. It is how you handle and store your beauty products that make it more susceptible in harboring microorganisms. If you have a box full of make-up, you might want to start cleaning now and don't be lazy doing it often because it is as important as cleaning your make-up brushes. How to sanitize them? I got you. Let's start de-germing! Cotton balls and swabs. This will be use to wipe off in cleaning our products. Applicator tip/Q-tip. If you have cotton buds readily available, that's better. 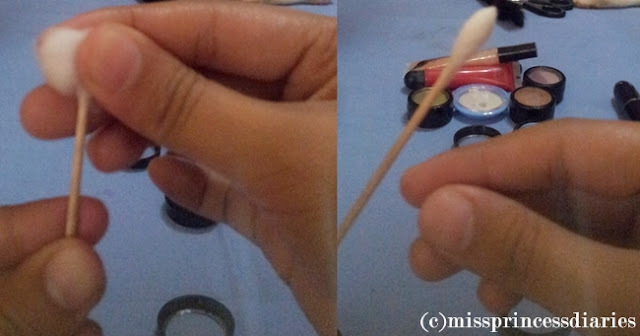 I have applicator tip to create my cotton buds. Alcohol and/or Sterillium. This is the disinfectant that we will be using. I preferred sterillium in cleaning my make-up. Although, some say commercially available disinfectants can be too drying to our products that's why there are commercially prepared products made for sanitizing make-up that has the right formula gentle for cosmetics. Spray bottle. It is easier to sanitize if you have spray bottle ready. I have seen that there are cosmetic sanitizer mist and swabs available in the market internationally. I just can't confirm if we have available here in the Philippines. If there is, it will be better to use. First and foremost, clean your hands. Hand wash or rub an adequate amount of disinfectant. There's no better way to sanitize but to start off clean. So, this is how I make my own cotton buds. 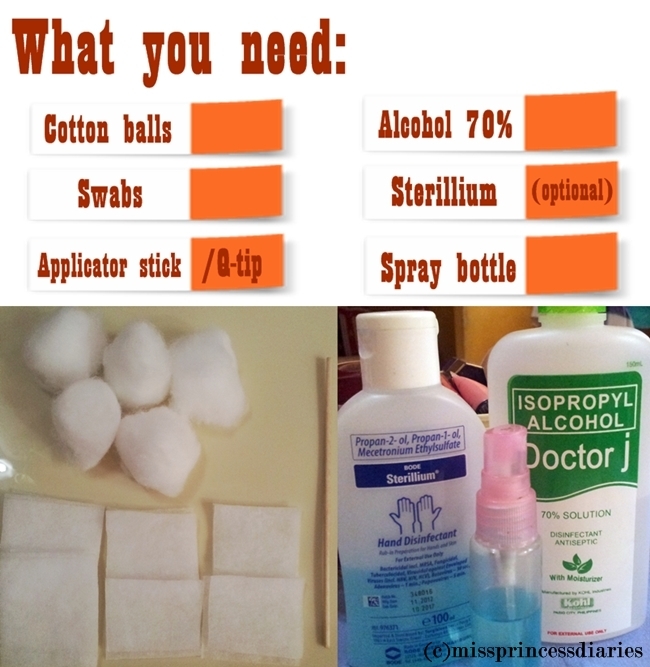 It is easy and affordable if you don't have available cotton buds/Q-tips ready. Powder. 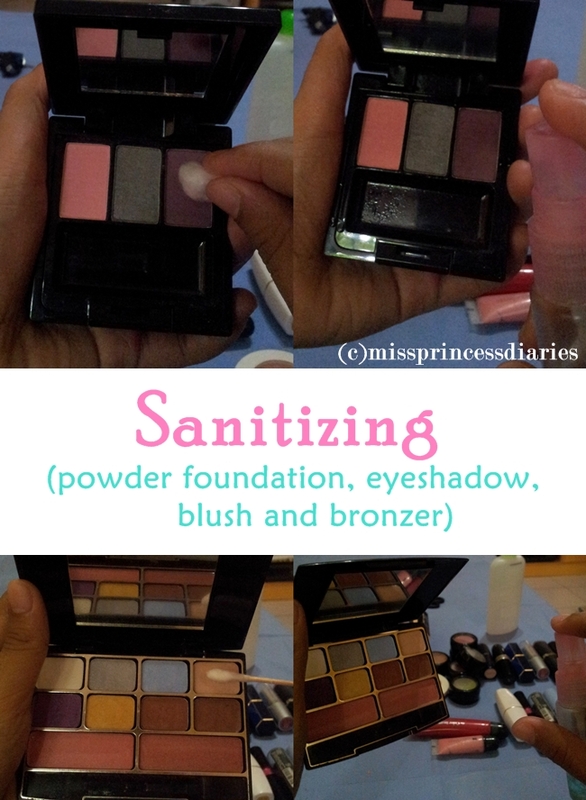 We always use our powder products everyday so we should clean/sanitize it as often as our brushes. It is useless to have your clean brushes every time if you have contaminated products, got it? Don't bother much, it is just easy as 1,2,3. First, get a cotton ball/Q-tip. Then, clean the topmost layer of the powder product. Lastly, spray it with disinfectant and air dry for 30 secs. You're done. Lipstick. We can't get enough of lipsticks. Few shades aren't enough. We always want to have it all. As far as cleaning your lipsticks are concerned, scrape just enough layer on the side and top of the lipstick using swabs soaked or sprayed by disinfectant. Then, spray disinfectant once more and air dry for 30 secs. Lip gloss. If you have a squeezable lip gloss like mine which, I don't put on my lips directly when applying. Then, you can just get a swab soaked/sprayed by disinfectant and squeeze some of the lip gloss out of the tube. By this, you are clearing out the most exposed part of the product to contamination. Lastly to top it all, clean/spray the opening of the tube. 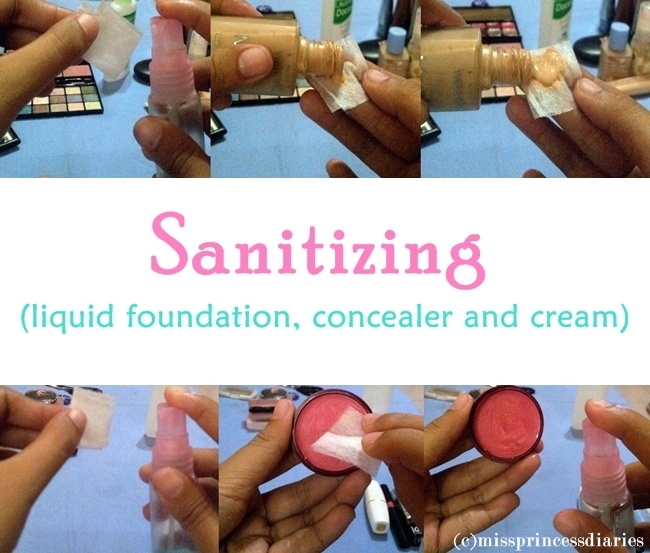 On the other note, if you have the lip gloss tube with the applicator or wand, what is more important is prevention of the contamination rather than sanitizing. Since, we always dip in and out the applicator to the product hence, we are more likely to introduce bacteria to our lip gloss every time we do pull it in and soak it again. That is why, it is also important to know when to throw it out when the texture and smell of the gloss isn't the same as you purchased it. Liquid foundation and cream. Where there is moist, there is bacteria. It is true that our liquid and cream products are the most susceptible in harboring microorganisms. They are most likely to be contaminated so, more proper and careful handling of these products is important or else they might be the cause of future breakouts which we don't want to happen. In cleaning cream-based products in compact, jar and pump is easier because most of the time the top layer/portion of the product is contaminated so you can get a swab soaked/sprayed by disinfectant and clear the topmost layer or squeeze out a little of the product and clean the nozzle of the pump. Then, set it with another spray of disinfectant and air dry for 30 secs. I almost forgot, do not forget to clean the caps too. Pencils. Sharpen them to remove the top layer of the product and spray disinfectant. Lastly, air dry. P.S: clean your sharpener too. For autopen eye and lip liner, you can gently wipe with swab soaked with disinfectant the top surface of the product. Set it with disinfectant spray and air dry. Alright! I hope you are conscious enough to clean and sanitize your make-up products just like how we choose what brands we put in our skin. Not only it will keep you away from all the germs but also, it will keep your products lasts longer. Although, we should also be aware of make-up shelf life and expiry. Don't worry! that I will be telling you more of that on my next post. Girly Reminder: If you are a fan of make-up tester in a counter of your favorite drugstore or dept. store, you can ask an assistant to sanitize the products before and after you use it on your face. If you aren't sure about it, just use the back of your hand in swatching. Keep wipes and alcohol handy as always. CatLovers: Unboxing: What's in the box?